Peanut butter has to be one of my favourite go-to spreads. But I have to admit, I always feel a little bit guilty after indulging in it. It may be delicious, but it’s packed with calories, and the non-organic peanut butter that fills most households is basically pure sugar, which is no good, especially if you’re trying to lose weight. You may know that the keto diet is one of the most effective eating plans for weight loss, but did you know the PB2 keto recipes offer an even better way to lose weight and make it last? That’s right, you can get all the benefits of the keto diet, plus even lower calorie snacks and meals due to PB2! If you’re looking for a way to sustain your health and weight loss goals, the keto diet may be just the thing for you. It’s a high fat, low carb eating plan that forces your body into a metabolic state called ketosis. When your body is in ketosis, it uses fat as its primary food source, rather than carbohydrates. Your body typically burns carbs for energy, but the goal of the keto diet is to rid your body of as many carbs as you can so that your body has to look elsewhere for fuel. It ends up burning new and stored fat for weight loss that actually lasts! When you eat keto foods and meals, your body can reach ketosis in around one to three days. The majority of your calories will come from fat, some from protein and little from carbohydrates. Along with weight loss, the keto diet has also been found to result in increased energy levels, mental clarity and appetite control. Never heard of PB2 before? You’re in for a treat! It’s peanut butter in powdered form, made by pressing peanuts to remove their natural oils and fat content. In the end, you get a powdered peanut butter that has about 85% to 90% fewer calories than traditional peanut butter! PB2 has become a go-to for the health conscious since it’s so easy to throw into meals, baked goods and post-workout smoothies. You still get the delicious flavour of peanut butter without all the calories! PB2 AKA low carb peanut butter, is extremely versatile, so you can use it in all your favourite classic peanut butter keto recipes and more! First things first, unless you’re baking with it or using it in smoothies, you have to add water to it to (typically, two tablespoons of powdered peanut butter to one tablespoon of water). This will create a PB2 paste. Using the peanut paste, you can smear it on apples, bananas, or rice crackers. You can also replace the peanut butter in your favourite Thai noodle sauce with PB2, or use it in its powdered form in baked goods. If you go the baked goods route, make sure to swap out about ¼ of flour the recipe calls for since you’ll be adding extra powder with the PB2. You can also substitute it in your favourite smoothie recipes. Add PB2 in powder form instead of high calorie peanut butter. And it will make a great addition to your favourite keto pancakes! You can also use it to make your favourite frozen treats or protein bars by simply substituting PB2! Don’t forget a classic PB&J sandwich, using the PB2 powder mixed with water to form a yummy paste! And if you love keto bombs, there are plenty of peanut butter fat bombs where you can substitute the peanut butter with PB2 for an extra delicious, low carb snack! Getting excited to start using PB2 recipes in your day-to-day cooking adventures? Take a look at 15 of our favourite PB2 keto recipes! PB2 recipes are a great way to get even healthier and lose more weight on the keto diet. Substitute PB2 in your favourite peanut butter keto recipes for weight loss that’s sure to last! 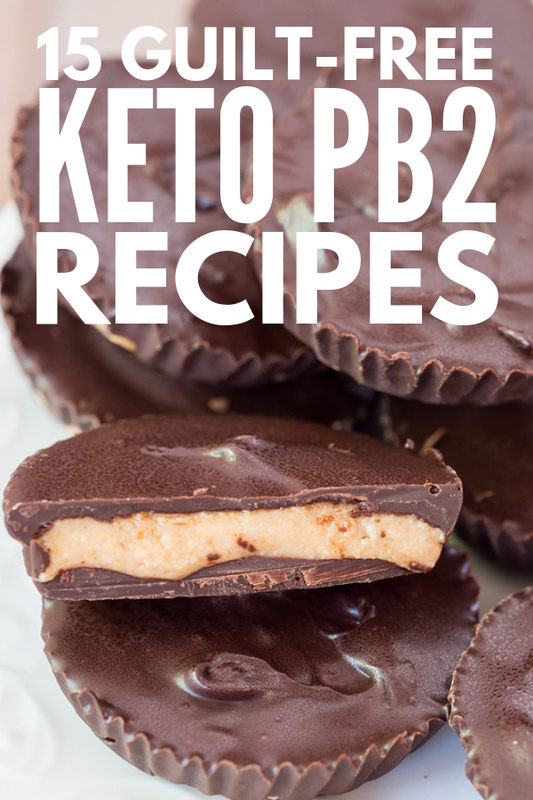 If you loved this post on PB2 keto recipes, we’d love if you shared it on Pinterest! And if you’re looking for more keto recipes, please follow our Keto Diet Board on Pinterest!